Here are two photos from a trip this summer to New York City. 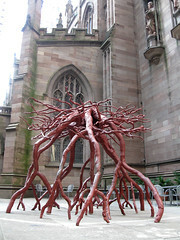 The first photo is of a sculpture at Trinity Church. It is made from roots of a sycamore tree knocked down on 9-11. 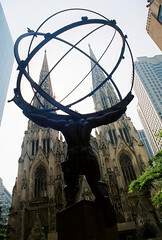 The second photo is of the Atlas Statue. The shot is of the backside with St. Patrick's Cathedral in the background.